The River Ythan (pronounced eye-than) is internationally known as an important Scottish sea trout river situated between the Deveron and the Don. In addition, in recent years the river has been yielding good catches of salmon. The season for both salmon and sea trout extends from 11 February to 31 October. Good catches of sea trout are normally taken from mid-May. 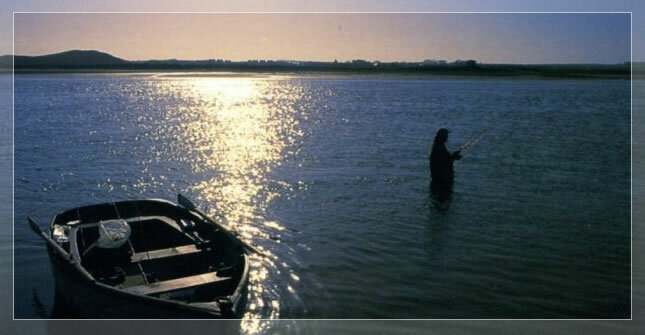 The Newburgh Fishings is thc most famous stretch of the River Ythan and is situated in the estuary. The outstanding aspect of these Fishings is the number and size of fish which are consistently caught. An excellent feature of estuary fishing is that the fisherman's not at the mercy of the elements. The fish are always present and can be caught throughout the summer months whatever the weather conditions. The water is fished both from the bank and in boats depending on the level of the tides The traditional time for fishing from the bank is from soon after the top of the tide to just beyond the turn of the tide at the bottom. Boat fishing frequently begins at half tide on the incoming tide. there are 17 main pools on this stretch. Fishing is entirely by traditional methods with fly or spinning line. Fly usually proves the most popular fishing method. Newburgh is situated some 14 miles north of Aberdeen. It is very convenient for Dyce Airport. Excellent and varied accommodation is available to suit all tastes. There are two excellent hotels in Newburgh itself The Udny Arms Hotel and The Ythan Hotel. In addition there are several holiday properties on the Udny and Dudwick Estates which can be made available on a weekly basis. The fishings are located amid some of the most attractive countryside in Scotland. Activities which take place in the area include shooting, fishing, golf, walking and bird watching.